Is there a way to Convert Roxie Photoshow files to play on my Windows Media Player? Thanks. What version of PhotoShow do you have? Do you have a premium membership. Have you looked at the third step? I don't know but it is an old one, Photoshow 3 I think. I bought it yrs ago, now with a different computer, I don't even have photoshow. I was hoping there was a way to view the movies I created on this new computer. thanks. What format are the saved PhotoShows? PhotoShow 3 was before my time. Go to the protoShow and right click on it. It should tell you what format, go to details also and post a screen shot of what you see. Could it be PhotShow 4 or 5, that is as far back as these forums (and possibly experience) goes. It could be Photo 4. Thanks. My only suggestion at this point and not have you spend any $$ would be to download the "free" PhotoShow and see if it will open that file. Get the fre version here. Let us know what happens. I downloaded the trial version as you suggested. 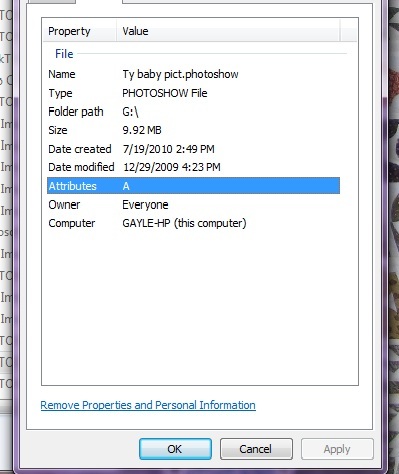 I could open the file using the Photoshow program. Now, is there a way to get the pictures off. I really appreciate your help. Please explain what I bolded. I don't have the free version. Are there options in step 3? What are they? How important are the pictures and do you want to spend any money?